Wiley and National Geographic College Atlas of The World | Mappenstance. 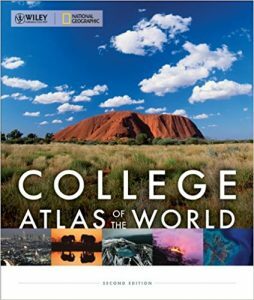 This atlas provides information on 25 themes, mostly environmental. It ranges from plate tectonics, to energy sources and population, all the way to conflict and terror. It is interesting because it correlates to the Ford Foundation and the wide array of programs the Foundation donated to. This atlas has over 55,000 named places the reader can look up in the index. Customer reviews also stated that the map has global themes dealing with energy, the environment, nuclear weapons, and politics.